Again, I first heard about Gerard Cosmetics through watching YouTube videos and I recently stumbled across their range of lipsticks when I was watching a video by Jaclyn Hill (yes, I am obsessed with her). Jaclyn Hill joined Gerard Cosmetics in the making of two lipsticks and two lip glosses - '1995', 'Buttercup', 'Rosehill' and 'Buttercream'. I, of course, have purchased all four of these beauties and I absolutely love them! 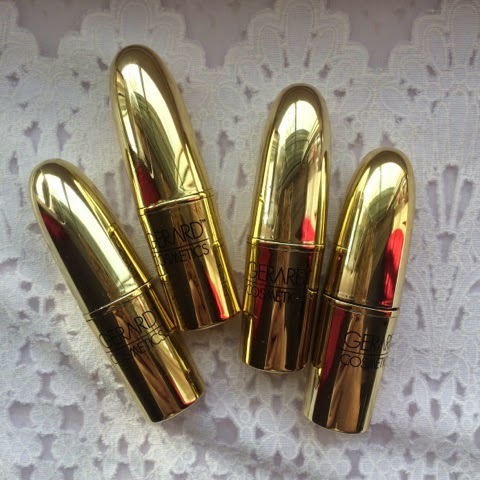 Gerard Cosmetics also sell other shades of lipstick and lip glosses too, some of which I have also purchased. 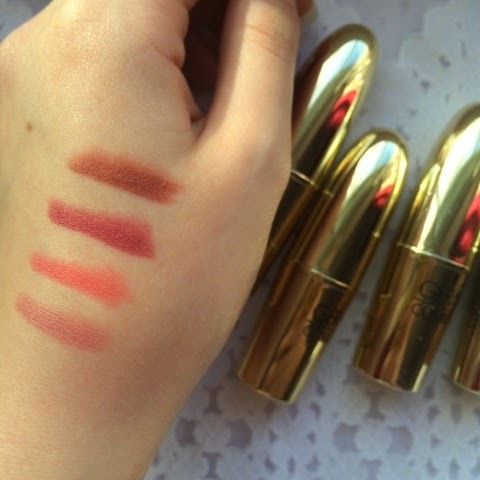 The lipsticks are super creamy and moisturising on your lips and this is something I tend to look/hope for when purchasing or ordering lipsticks as I don't have super smooth lips naturally. I also love how pigmented all of their lipsticks are. (There is nothing worse than purchasing a lipstick and it not being pigmented). 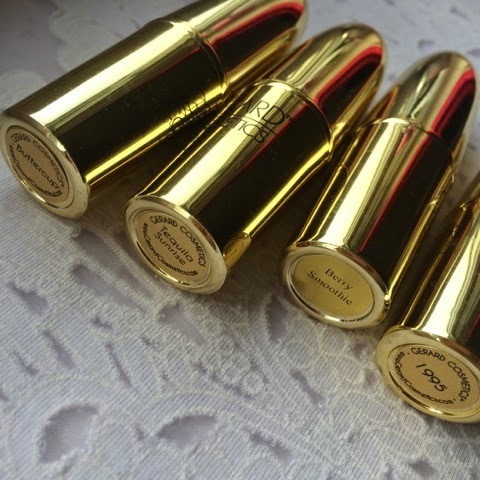 The packaging of the lipsticks is gorgeous! It's a simple design of gold with black writing but I really do love that simple yet classy design. The lip gloss shades that I own I am obsessed with and it's also really nice that they aren't sticky (which is a common problem with most lip glosses). However, I do find that they accentuate the dry areas on my lips and this is the one thing that I do not like about them. That being said, I would not say that it is the formulation causing this, I just probably need to moisturise my lips more. They offer quite a wide range of shades in the lip glosses (including some very vibrant ones, such as blue..). 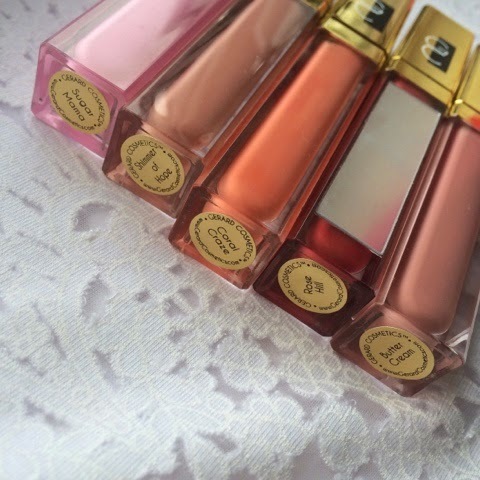 The packaging for the lip glosses is very different! This is because when you go to apply your lip gloss, if you tilt the tube horizontally you will see a thin mirrored strip and you use this as a mirror (obviously) to apply your lip gloss. However, that isn't even the best part.. It lights up!? A light activates when you pull the applicator out the tube. I'm sorry, but how cool is that?! 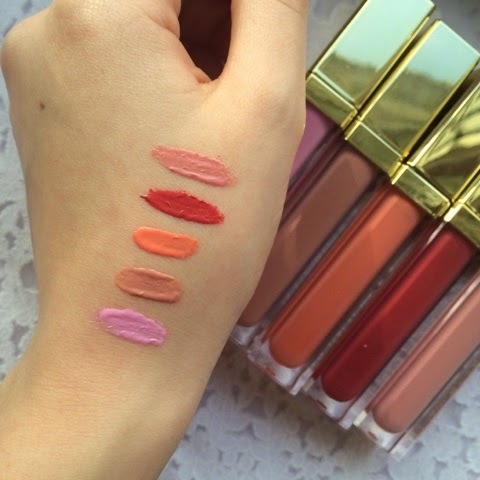 I must say that I do prefer the lipsticks to the lip glosses, but then I always have done so that is no negative towards these particular lip glosses. 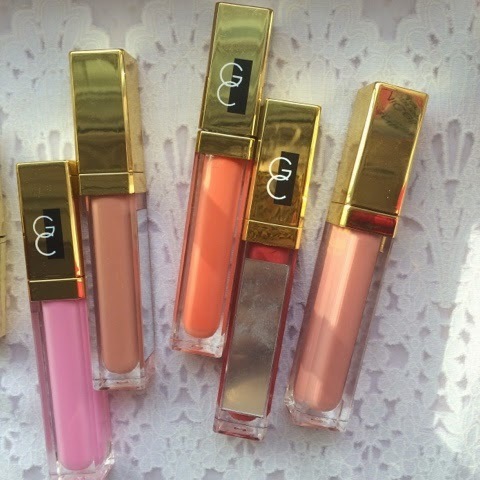 The lipstick and lip glosses are reasonably cheap (if you're ordering from the UK) and Gerard Cosmetics almost always have some sort of discount code that you can use to make your order that little bit cheaper, which is always a plus! Considering that you are ordering from the US, shipping is pretty quick and quite inexpensive (it is currently free!!). This definitely makes ordering from Gerard Cosmetics all the more appealing.